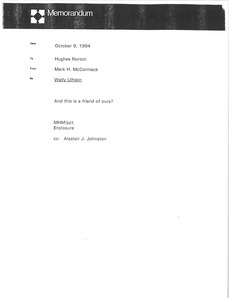 Regarding the attached memo, when McCormack would like to arrange a atime when him, John Macklin, Bob Kain, and Peter Lewis could get together. 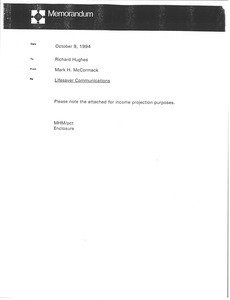 In the attached, John Macklin is updating McCormack on the Progressive Corporation, saying that they may have an opportunity now to work with them in terms of advertising. 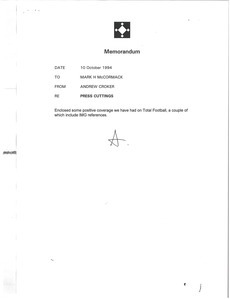 Regarding the attach fax from Haji Fukuhara, McCormack would like him to see it to consider proposing the idea to Steve Friedman. The attached is proposing that American Express do a joint venture with Golfing World. 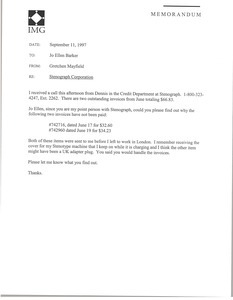 Concerning two outstanding invoices from the Stenograph Corporation. Asking if Dirvin asking him if he would be willing to share his process for how he appraises and reward his employees. McCormack says that IMG's process is currently under review so they wanted to hear how other companies procedurally handle appraisals and salary rewards. Concerning the attached articles that contain some positive coverage of the Total Football project, some of which reference IMG. Enclosures not digitized. 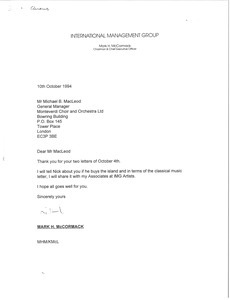 In response to MacLeod's two letters, McCormack writes that he will tell Nick Faldo about MacLeod, should Faldo buy the island in Scotland, and will share MacLeod's letter regarding classical music with his associates at IMG Artists. 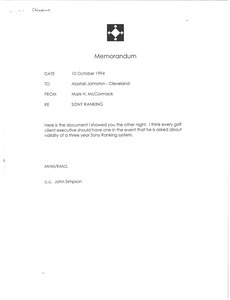 McCormack sends Johnston a document regarding the three year Sony Ranking system, and writes that every golf client executive should have a copy in the event that he is asked about the validity of the three year Sony Ranking system. McCormack sends Johnston a copy of an invitation he received from the Adios Golf Club for an event to honor its founder and architect, Arnold Palmer. Attached correspondence with Lifesaver Communications over a preliminary joint agreement between the companies that had IMG serving “as an overall strategic marketing partner” for Lifesaver. 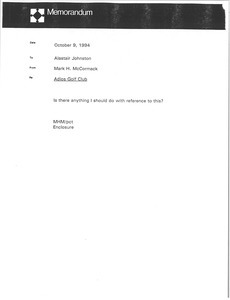 Concerning a letter McCormack received from Wally Uihlein; the letter discusses the 1995-1997 agreement proposal he created with Colin Montgomerie.